WASHINGTON – As governor, Arizona Attorney General Mark Brnovich would declare every day Grateful Dead Day and take down SkyNet, the self-aware computer network that menaces mankind in the “Terminator” movies. But he draws the line at finding another attorney general. Those were some of the fanciful exchanges when Brnovich found himself acting governor this week, in the absence of Gov. Doug Ducey and Secretary of State Michele Reagan. Brnovich asked his Twitter followers if they had any requests while he was all-powerful – in an acting capacity, of course. Some tweets asked for the frivolous – free ice cream and a Grateful Dead day – while others took the opportunity to push more substantive issues, urging Brnovich to drop a lawsuit blocking in-state tuition for Dreamers, or to increase funding for schools. “Clearly, we were having a little fun yesterday with our tweet,” Brnovich said in an emailed statement. “But I stand ready to assume any duties or fulfill any responsibilities necessary, should the governor need me. “In the meantime, I would like to unofficially declare today Grateful Dead Appreciation Day,” his statement said. 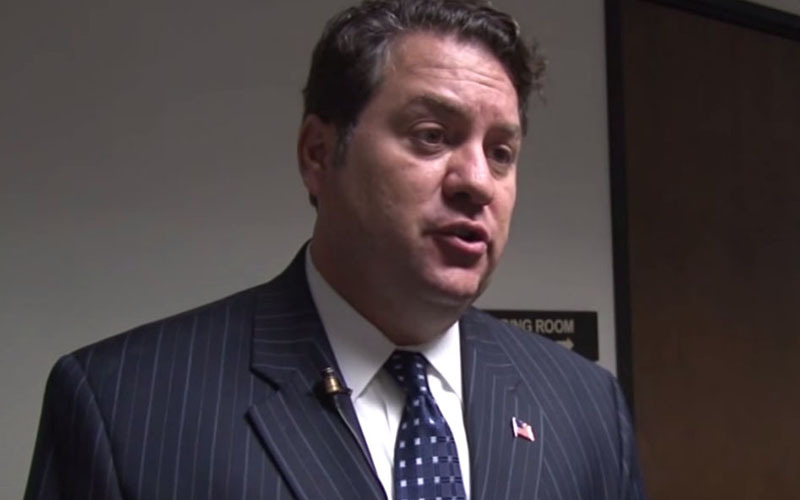 Brnovich was called on to serve as acting governor under Arizona Constitution Article 5, Section 6, which states that in the governor’s “absence from the state” the powers and duties of the office are handed over to the next person in the line of succession. Ducey was in San Diego on vacation with his family, which means his duties would have been taken over by Reagan, the second in line for the governorship. But Reagan was in Indianapolis at a conference for lieutenant governors, followed by the National Association of Secretaries of State conference in Portland, Maine. So for the 28 hours they were both scheduled to be out of the state, No. 3 Brnovich became No. 1. Political staffers said the constitutional provision made sense in the early 1900s, when Arizona became a state. But they questioned its usefulness in the 21st century, when the Internet, modern communications technologies and air travel allow a governor to very easily lead from out of state for a few days. Few seemed worried about a coup, however. But it can still be exciting to be acting governor, even if the person holding the temporary job doesn’t wield any real additional power, said one man who’s been there. “Other than me, absolutely no one cared that I was acting governor. I thought it was kind of cool, but when no one else cared, I didn’t either,” said Grant Woods, who was attorney general from 1991 to 1999. That didn’t keep Arizona Treasurer Jeff DeWit – No. 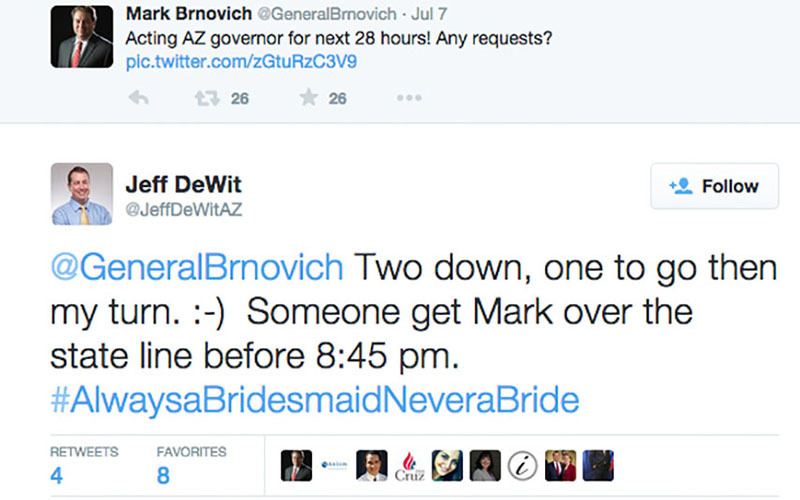 4 in the line of succession – from tweeting out late Wednesday that someone should “get Mark over the state line” before Ducey’s return, with the hashtag #AlwaysaBridesmaidNeveraBride. As if to illustrate what a big deal it isn’t, a spokesman in Brnovich’s office said there is no formal notification of the shift in duties – the office only realized it after getting letters from Ducey and Reagan mentioning that they would be out of the state. 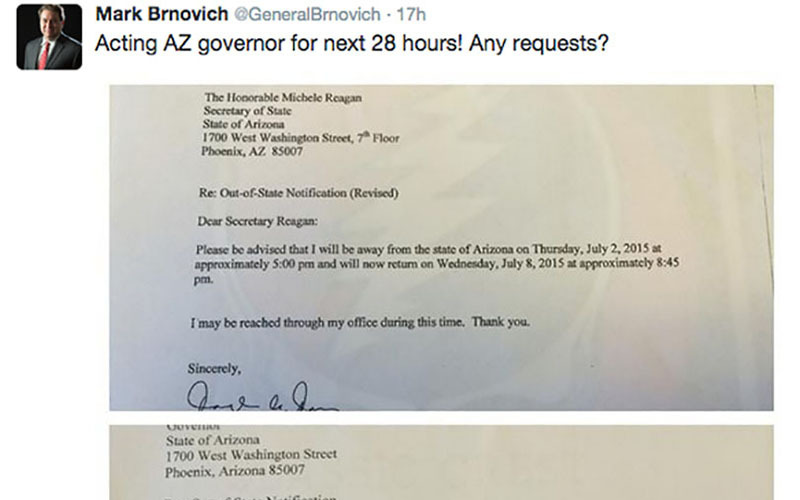 That’s when the office posted the tweet asking for requests of the temporary governor. But even if he wanted to make the changes, the clock was working against Brnovich, as Ducey was scheduled return Wednesday evening. And there’s no guarantee Brnovich’s legacy would be kept intact.